My visit to Sydney started on a bridge – in this case, the ship's bridge, as I narrated our sail-in to its beautiful harbour. 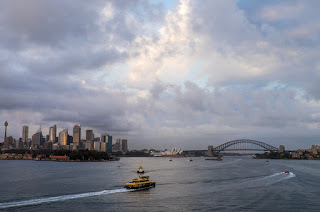 As we sailed under the huge Harbour Bridge, I began to feel the enormity of what I was going to do later in our visit – do the bridge walk (a challenge that I have wanted to do for the last 18 years, but have been too scared to attempt). 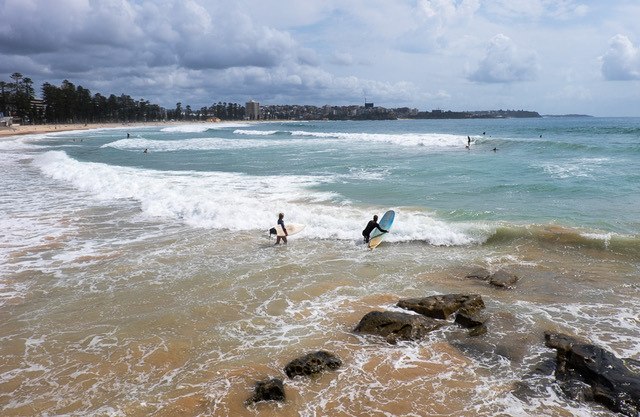 But first, we were going to spend a day at Manly Beach – a place that doesn't have all the international fame that Bondi Beach has gained, but it doesn't suffer by comparison for natural beauty or the quality of its waves. The great thing about Manly is that it's so easy to get to – just a 25-minute ferry ride away from Circular Quay, but a world away in atmosphere from the hustle and bustle of the CBD. 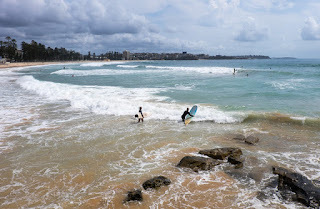 Of course, that long golden surf beach is the main attraction here, but the laid-back atmosphere was that of an upmarket suburb combined with a barefoot surfers paradise. 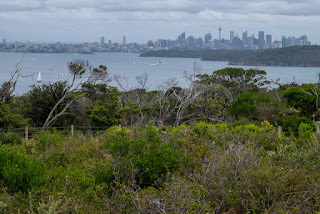 To get up an appetite for dinner, we did a long (15km) walk around the coast up to the North Head, passing by a couple of attractive beaches, and then through some unspoilt native bush. We didn't meet a soul as we trekked through the forest and brush, to a background theme tune of buzzing insects and the squawking of exotic birds. Every now and again we'd get a glimpse through the trees across the harbour to the skyscrapers of Sydney in the distance – it was amazing to have the feel of being in the wilderness but still be so close to a big city of 5 million people. A long, lazy lunch overlooking the sea rounded off a really nice time in Manly, before we sailed back to the CBD and did a little exploration of the Rocks. 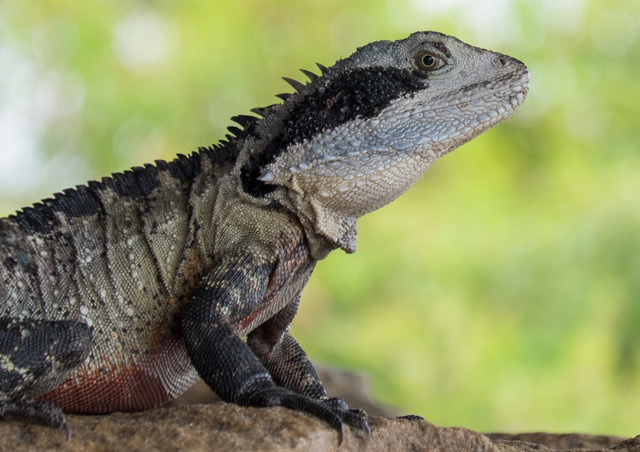 That evening, we went out for a lovely curry in Balmain, my enjoyment only slightly curtailed by the fact that I couldn't wash it all down with a beer or two. It's not that I had joined the Temperance Society – it was just that before you can do the bridge climb, you get breathalysed and I didn't want anything to stop me (even one pint of beer, 12 hours before). So, the next morning was B-Day. 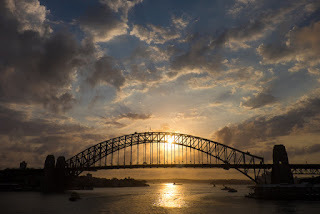 Actually I was surprisingly calm that morning, and once you get to the bridge you have such a long induction and detailed preparation that any nervousness gets mostly diffused. It's a very slick operation, and you're clipped onto the bridge at all times, so any fear can only be in the head, because you know that it's totally safe. Actually, if it hadn't been for the incredibly strong winds blasting us as we climbed (around about 40-50 mph), it would have been a breeze (quite literally). The rigmarole of the whole thing, climbing ladders, clunking your harness along the guide wires, kept your mind focussed on the exercise, rather than the fear factor. 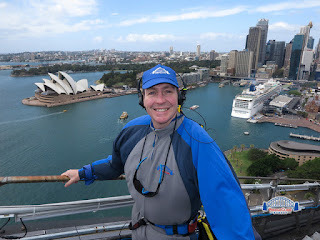 Of course, the views were nothing less than spectacular, and every now and then you got the realisation of what an incredible position we were on – climbing up and on top of the largest arch in the world, well over a hundred metres above sea level. The only downside was that you're not allowed to take a camera with you to record it for yourself; but, of course, the money men have dictated that we had regular stops for the "official pictures" that you could buy for $60. It was a surreal experience, only heightened by the ridiculous get up they'd put us in – a grey and blue jumpsuit, with a bright blue baseball cap, that made us look like a group of low-grade children's TV presenters from the 1980s. Yet, somehow the strange outfit is part of the ritual – you're so far out of your comfort zone, that looking like an idiot is the least of your worries. As the walk up to the top of the arch continued, I was getting quite nonchalant about the whole thing, occasionally relinquishing my iron grip on the guide rails and pretending to be unbothered by the vertigo-inducing views. In fact, I felt quite smug on the way down as we saw a group on the way up that had ground to a halt as one of the victims succumbed to a panic attack, and had sat down on the arch and refused to move, gripping onto the rail for grim death. Maybe this was a bridge too far for some people. Climbing the bridge is a challenge that somehow seems a lot less challenging once you've done it. 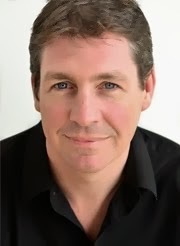 It's not particularly hard physically – it's all about the conquering the mental side of things (and it's obviously not dangerous when you think about it). But, looking back, the best thing about it is just the totally unique perspective that it provides on the world's most beautiful harbour. A thoroughly enjoyable experience that gives you a real sense of achievement – if only they hadn't told us that 3.5 million people had already climbed the bridge before me, I might have felt that I was a bit more of a fearless trailblazer.